Naval Group has achieved another milestone in the Future Submarine Program with the signing of the first phase of the Submarine Design Contract. The contract was signed by The Hon. 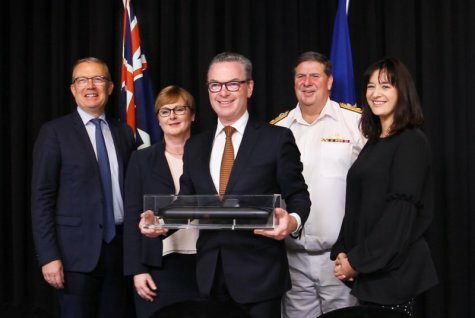 Christopher Pyne MP, Minister for Defence and representatives from Naval Group and the Commonwealth of Australia (CoA) at a ceremony in Canberra. The Submarine Design Contract is the first contract work-scope to be fully executed under the Strategic Partnering Agreement. The Submarine Design Contract also includes ongoing preparations for the build of the Attack Class in the Osborne shipyard in South Australia, including ongoing support to Australian Naval Infrastructure (ANI) for the design and build of the Submarine Construction Yard and the ICT systems that will be employed in there. “There is tremendous continuation and progress being made with the Future Submarine Program,” said Jean-Michel Billig, Executive Vice President Future Submarine Program, Naval Group. “The signing of the Submarine Design Contract is another significant milestone in the journey of the Future Submarine Program. “Through the execution of this Program, the Naval Group teams in both Australia and France will deliver a sovereign, regionally superior submarine capability to Australia. “In doing so, we will also help build a stronger Australian industrial capability, which will be supported by a skilled and experienced Australian workforce, providing jobs and other economic benefits for decades to come,” said Mr Billig. The first phase of the Submarine Design Contract is worth $605 million and will extend through to 2021.